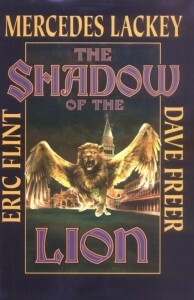 My Twitter friend @lianabrooks had a very specific request for a Friday reads recommendation yesterday for something “high fantasy set in Venice with pirates and witches.” It reminded me of the epic fantasy Mercedes Lackey co-authored with Eric Flint and Dave Freer. She asked me if it was good, and since Twitter just isn’t the place to get into that kind of answer in the depth I prefer to give… I’m just going to write a review here. A failed magician must find courage. An orphaned outcast must find his strength. A reluctant prince must choose between duty and pleasure. A dangerous beauty and a man of faith must make uneasy alliance. All will be consumed by an evil greater than they have ever known, if they cannot find safe harbor beneath The Shadow of the Lion. The book starts with a prologue to acquaint the reader with the main players, then dumps you into the middle of a scary escape that allows the young protagonists to meet up and gain a little understanding of each other and build the beginnings of trust between them. However, in this version of Venice, there are magic-empowered priests and nuns and the vast gulf between those in power and the street urchins is all the more insurmountable for the additional weight on the side of the powerful. Coming from Claudia, that was scary. Still. All Katerina wanted him to do was to recover that parcel. She’d offered an entire ducat for the job, too. She’d been pretty pointed in her comments about what would happen to him if the stuff turned up on the market. If you’re lucky, the Servants of the Trinity will get you before my … associates do. Yeah. He’d fish that parcel out and leave her well and truly alone. He had responsibilities now. He might even have turned away from that ducat if he hadn’t been feeling guilty about not getting to the rendezvous. In the shadowy side of Venice, you were a man of your word or you didn’t survive. The story evolves into a full-throttle crash course with war, complete with evil clerics and hidden ties among disparate characters, so while it is long (and, apparently, the first in a trilogy) the pieces come together in a fully satisfying way at the end of the book–with some intriguing possibilities left open to the future. In answer to Liana’s question: Yes, it’s a good book. It takes a time commitment, so it’s not one I’m going to reread any time soon, but it has a permanent spot on my library shelf, and someday I will get around to the second and third in the trilogy. It’s a little more violent than I like, with the thugs and their beatings, and the general misery in which the main characters live. But the relationships between the characters are real and develop naturally. They force you to root for them, and hope they grasp their powers in time to save the city. Plus, who doesn’t want to read a book leading to the awakening of an ancient, magical beast of a city protector?